Today, I would like to introduce you to one of the YTM 2018 Partners, Meirav Dulberg from Webby Web Designs. We first met at a Heartlink event in Brighton about 5 years ago, and overtime we have developed our relationship and grown our businesses. Last year Meirav came to my rescue when I was let down badly by an overseas supplier who had been recommended to me, but proved to be unreliable and wasted many months of my time. Meirav suggested I consider a Squarespace website. She is also a capable coder, and I knew she would have my best interests at heart. For me, know, like and trust is critical and whilst you can know people, you may not always like or trust them. Meirav, how did you come up with your business name? When I established my business 10 years ago, my goal was to provide a down to earth and friendly service. All the web companies around were very technical and their names reflected this. Therefore, I was looking for a name that will reflect my industry but also ‘approachable’ and Webby was the perfect solution. I’m now called ‘Webby’ by a few of my clients as my name is not an easy one to remember but Webby is! I help business owners bring their business to life online by providing web strategy, bespoke design, custom development (with Squarespace, Shopify or custom code) and support which can be website updates or training and workshops. Stephen Read (a YTM partner) told me after I completed his website ‘every time I look at my website I smile’ this is my ‘why’ – I love helping people by doing what I love. I also love the time that my business gives me time to enjoy life and family – I love to travel and taking time off and travel around the world is another reason for why I do what I do! My husband who is also a developer came up with the idea… I had a strong background in website marketing and strategy from my corporate life and had the creative background as well. He suggested that I learn to learn how to code, so I did and the combination of the 3 skills was what I needed to start my own business. First, I love helping a varity of businesses and people – every job is different, and I get to learn a lot – from construction to yoga to law or baby food, I get to work with a diverse range of businesses. Secondly, I love it when a site is launched, and clients love their website and even more when they call me to tell me how it helped grow their business. A website is an essential part of any business but most business owners I meet are not proud of their website – they don’t love their website and they say they don’t understand or don’t want to know anything about it. I want to empower business owners to understand the basic elements, to educate them and to create websites that they love. I have plans to expand my offering and to host more workshops for my clients and for businesses owners in all levels – teaching basics to startups, website strategy workshops and general web education. I’m also looking forward to stronger collaboration with business I’m already working with to make a stronger team that can deliver an agency style product – I believe that collaboration is key as each of us have different strengths and together we can deliver great results. Time balance is key – I always start my day with a short walk and a coffee and make sure I take time to be with my family – I find that doing this helps me to be more focused and productive with my work. I met wonderful people and made great connections for collaboration. Being a sole trader for 10 years I find that without a community I could not survive and being part of the YTM community provides not only business connections and insights but the social aspect that is important. Please share your favorite quote with us about time or business. “Time you enjoy wasting was not wasted” – John Lennon. Instagram https://www.instagram.com/webby_melb/ (for inspiration and fun) and via my website www.webbywebdesign.com.au . I invite you to join us at a coming YTM event and meet Meirav in person. 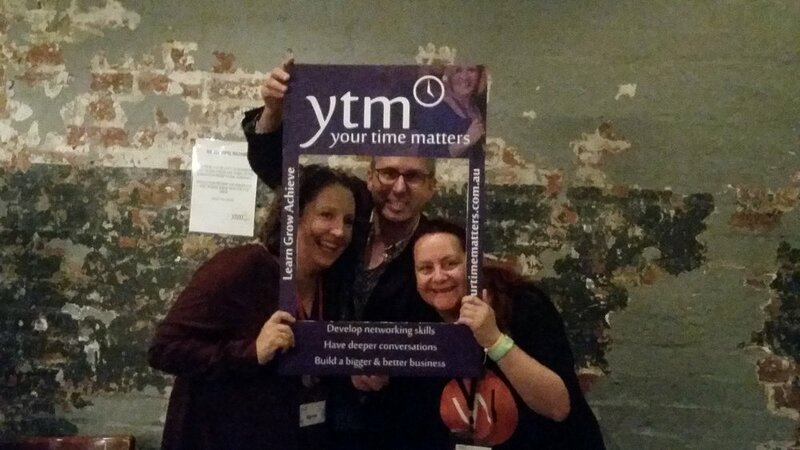 If you would like to attend YTM before 31st October, please contact Kerryn here to receive $40- credit towards your ticket.